We reported yesterday on the news that Koji "IGA" Igarashi has parted company with Konami after 24 years of service. Igarashi-san is perhaps best known for his work on the Castlevania series, an association which began with the seminal Castlevania: Symphony of the Night. The game combined the signature gothic platforming action of the franchise with a non-linear map which seemed to reference Nintendo's equally beloved Super Metroid. This led to the creation of the term "Metroidvania". I was actually surprised by the name. In my heart, I really wanted to create a Legend of Zelda style game. But I suppose that when you turn Zelda into a 2D platformer, yes, it resembles Metroid. I thought it was because of the game's super jump, which is very similar to Super Metroid's. When I left Konami, they told me I couldn't use the name Castlevania when talking about my plans. So it was actually really handy that the word 'Metroidvania' existed! 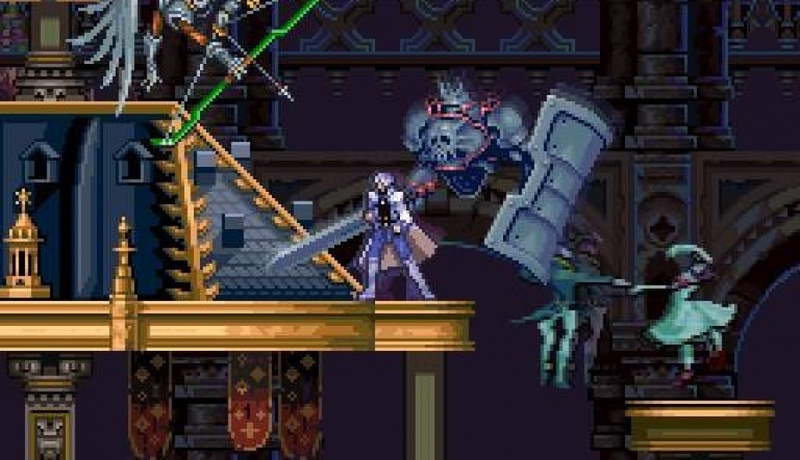 Hopefully we'll see another Metroidvania-style game from Igarashi in the future, one which builds on the excellent work he and his team did on Dawn of Sorrow, Portrait of Ruin and Order of Ecclesia. He could just call it Dracula's Castle though or something like that. (Konami took the name Dracula from elsewhere anyway). We need a real Castlevania games on the 3ds. No LOS stuff. There was what,6 great portable Castlevanias on Nintendo handhelds. I miss those great games. I want MOAR! @shigulicious I hear ya, but with IGA gone, we're unlikely to ever get one on the 3DS. I used to call it Castlemania as a kid, so theres that! This makes me want another 2D side scroller Zelda game, The Adventure Of Link was great. I loved the challenge of it, the last few Zelda games have been too easy. Well Castlevania may be gone, but good to see that IGA's going to continue making the games we love. Konami told him he can't use 'Castlevania' when describing his future projects? And he's going to give a speech of Metroidvania in GDC? This guy has a plan already, and it's ready to be executed. I'd say it's inaccurate too. I just call it "like metroid"
Konami isn't stupid, after seeing NO.9 they know a key developer of one of their biggest series leaving spells trouble. All Koji Igarashi has to say is "I'm making a Castlevania-like game" and their fans will flock to it. Pretty clever to use Metroidvania to get around that little catch. Whats funny is Metroidvania would be a more specific description of the kind of game fans would want anyway. I think he has a session at GDC about this too, would be interesting to hear what he has to say. I'm really hoping he has a new partnership in the works and eventually gets his own Metroidvania up off the ground. More equipment to find/wear, more weapons, an even bigger non-linear map, and something as wild as the upside-down castle. Would be nice if he keeps with the Dracula mythos too. I remember when I first played Super Metroid and I thought that was like a side-scrolling version of Zelda. Lol oh wow. Well, either way I love the genre! Konami is a little b!tch. Just sayin. @Baum897 It's probably part of an intellectual property policy or a "do not compete" clause that the company puts in its employees' contracts. So that Mighty Number 9 doesn't happen to them, or at least not with all of the easy publicity. Metroid is my favorite series, but other than Rondo of Blood, I've never played a Castlevania game through. That means I have at least seven Metroid-style Castlevanias to look forward to when I finally get around to it. That's why I love retro gaming. @JumpnShootMan @JumpnShootMan That's exactly what I took from it. Well that's odd cus I generally don't care for Zelda much, but 2D Metroid and Castlevania (especially Metroidvania) I find both amazing. So... Inspired by Zelda 2? Or was the first Castlevania released before that? Somehow, I don't see Konami being as stubborn as Capcom when it comes to Castlevania. With the Lords of Shadow series ending with the most recent game, and Konami being fully aware that Mecury Stream is moving on, I think Konami might have something up their sleeves. I would not be shocked if a retro style Castlevania or another Metroidvania gets announced, maybe timed around Koji's announcement. Here's the thing, I don't see Castlevania ending. Unlike Mega Man, numerous teams have worked on Castlevania games. Even if Lord of Shadows 2 flops, Konami can toss a Metroidvania onto PSN, Xbox Live, and the eshop, and fans will gobble it up. It would also overshadow Koji's project if Konami times it right. The only reason why Mighty No 9 made so many waves is due to Capcom's stubbornness with the Mega Man franchise. If Capcom announced we were getting a Mega Man 11 or a Mega Man X9 in 2014 or 2015, Mighty No. 9 would lose some of its hype. I don't think Konami is stupid enough to let someone else profit off the Metroidvania formula. I have a gut feeling that if Koji tries to make a new game with the Metroidvania formula, Konami will be ready with one of their own. Konami knew that no matter how Lords of Shadows 2 does, that's the end of the LOS series. I think they have something else planned for Castlevania. I find it very intresting that Konami did not let him use the term Castlevania to describe his plans. It might be a simple matter of protecting their copyright, or they already had their future plans for the Castlevania series laid out, and Koji was not involved in them. @Caryslan I would be very surprised if Konami come out with another Metroidvania style game. They're the ones who decided to ditch that format and put Iga on the cold bench. While it is very plausible that they already have something planned for the franchise, but I highly doubt that it is going to be a 2D sidecrolling game. Let's not forget the was one Castlevania Metroidvania clone DSiware called Soul of Darkness and that didn't use any Castlevania references so if they can do it I am sure that IGA can. Also keep in mind it doesn't have to involve Dracula or a Gothic setting to be a great Metroidvania just look at the new Strider. I guess a lot of people forgot about Zelda: II. It's not a bad game. It just was not executed properly. Restore points on the VC greatly help one enjoy it. Maybe Nintendo could try to redo the sidescroller formula with a new entry, (The CD-I games don't count)! That's a pretty sweet game. Too short but it would have been great to get a sequel on the eshop without the size limit. I suddenly want to see a Zelda game in the Metroid style. Amusing article and I can see his point, but it also looks like Konami is taking the childish low road banning him from using the word Castlevania when discussing games as that just comes off as cheap and petty. I'd love to see how they could even enforce that as I don't think the Japanese have word police. This reminds me of "cave story". Amazing!